T-Mobile’s Un-carrier Unwrapped program has been doling out gifts to T-Mo customers and those folks on other carriers for the past few weeks, and today the final gift of the promo has been revealed. Starting Friday, December 18, T-Mobile will take $100 off all four of Samsung’s 2015 flagship Android smartphones. That includes the Galaxy S6, S6 edge, S6 edge+, and Note 5. The fine print of the offer says “Qualifying service; device purchase, EIP Agreement or JUMP! On Demand agreement; and device tax required,” so it sounds like you’ll have your choice of buying method if you do decide to take advantage of this offer. It also notes that the $100 will be taken off at the point of sale rather than applied as bill credits. If you do pick up one of these Samsung devices, you’ll also receive a code for a free year of Netflix — specifically, the “2 stream” plan — which ought to be a good way to try out T-Mo’s Binge On video streaming. The free year of Netflix is good for both new and existing subscribers, so if you’re already a Netflix user, you’ll get a 12-month credit added to your account. These promos will be available to everyone in stores, over the phone. The Samsung smartphone discounts will be offered through December 23, while the free year of Netflix will be available through December 31. One other tidbit that’s worth noting is that Samsung is still running its Samsung Pay promo, which will get you a $50 rebate check when you activate Samsung Pay on a T-Mobile S6, S6 edge, S6 edge+, and Note 5 and then register at least one credit or debit card. This offer runs through December 31. 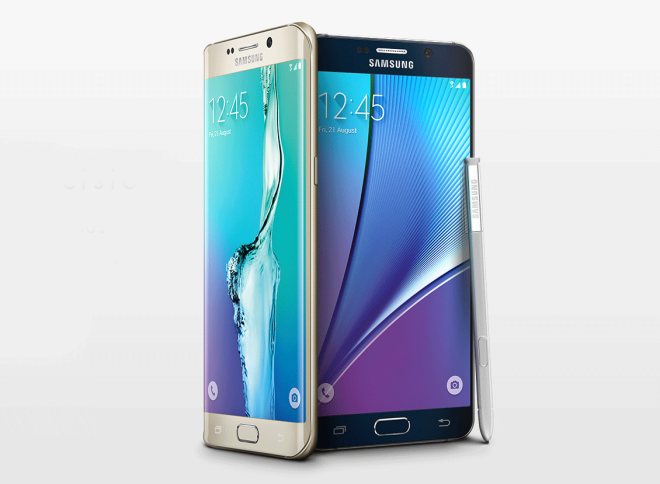 Samsung’s Galaxy S6, S6 edge, S6 edge+, and Note 5 are some of the best Android phones of 2015, and because all four on sale, you can save money no matter if you like a smaller phone for its one-handability, a phablet, or a phone with a curved edge screen. And hey, now that we’re in the thick of the holiday season, this promo could be a good opportunity to treat yourself to a shiny new smartphone. You’ve been good all year, right? Anyone know how rebates work on JOD? I have the iPhone 6 promotion, but am wanting to switch back to the Note series. Do they take 100 off the phone, then spread the payments out, or do they just not give the discounts on JOD? It mentions that JoD is included in the discount promo, so I would assume that if you are eligible to JoD, you could cash in on this no problem. Yes, just confirmed with a phone rep. Am considering jumping my V10. I spoke to a phone representative and they said the $100 only applies if I bought the phone outright. I guess we’ll find out starting tomorrow. Did the person who told you that have a thick Indian accent? I’ve found T-Mobile’s outsourcing their Customer Service to India to be extremely frustrating. They’re rarely up to speed on current promotions, and are difficult to understand most times. I’ve asked to be transferred to the Loyalty dept before and they were able to transfer me to a US based rep who was able to take care of my issue. Try that. I tried again on chat, and the rep told me that you can get the $100 discount on JOD. I verified it with him several times. He said that the $100 will come off the price, and then the JOD payments will be lower, so whatever that works out to be. I think it is 29 normally for the Note 5, so probably $25 a month or something. If that’s true, I’ll trade in my iPhone 6s+ and get the Note 5. And let me just say, this is my first Samsung device since a Note 2 I had briefly and it is GORGEOUS. I am loving it! Everyone I spoke to was American. I’m pretty sure I spoke to someone in the loyalty dept at some point. Not surprised. These days it seems every rep you speak to has a different answer. T-Mo customer service used to be tops. Quick expansion probably lead to inadequately trained staff. When I wanted to move to Jump from my Nexus 6, I spoke to four or five different reps, went to two different stores and chatted with two other reps trying to resolve an issue. Every single time I got a different answer from the next person. It was loads of fun. Netflix is currently $8, and likely to increase in price next year. That’s $100 off AND $96 worth of free Netflix. So $196 in savings. Up to you though. Personally, I havflix already. If you already have Netflix, your next year will be free. Good point, I am still considering it, but just smashed the camera lense on the back of my S6 (I bought in October without using my JUMP and only received a $50 Best Buy gift card for buying so that’s why I was considering JUMPing to a Note 5), does that stop me from JUMPing it? It still works perfectly, no damage to the screen or body except the lense cover, camera still takes amazing photos. Will T-Mo take that as a trade in or make me pay the insurance deductible? Smashed the camera lens? That’s a good reason to upgrade, bro! Yeah, except if they make me pay the deductible first, then I am out $175. I guess it won’t hurt to try, if they want me to put in the insurance claim, I’ll just ebay a lense cover for $4 and then JUMP. Yeah, it all depends on what it ends up costing you. I only do the insurance if the phone has a good resale value. Pretty sure the Note 3 I have isn’t work the insurance. I’m honestly thinking of upgrading, with the Sammy promo deals it is worth it’s weight in gold. This is better than any black friday deals. mine came all packaged together. odd. That’s upsetting, I thought it was weird that it came alone, but then I thought maybe they just ship from different places. It’s taking a long time for the rest to get here, too. The headphones I really don’t care about, but the portable charger would be nice to have. I left Samsung because of numerous issues and tried the LG V10. I really liked the LG V10, but I had WiFi connection issues and the phone would slow down a lot. YouTube videos would freeze, and alot of stutters, restarts and the system would become stuck. I didn’t know why. I was told I had a bad unit. I am trying an iPhone 6S Plus for the first time. The iPhone is not perfect. I find it difficult to choose a ringtone of my own making, but I heard I have to connect to iTunes, so I will try that out when I get home. The iPhone doesn’t lag, per say like the Samsung, but it does stutter often with iOS 9.2. I have been able to do everything on the iPhone my Android phone did before, except any customization, besides changing wallpapers and creating folders. I have been told to try an iPhone for the longest, but I really don’t see anything special about it, besides the App Store. The apps in the App Store are fantastic. Even some apps, in my opinion, are designed better for the Android system, but overall they’re good. I have no major problems. I will say that the iPhone has better battery life, but the LG V10 was also very good. When I had the Note 4, the battery would always drop to 0% from 10-12%. I could never understand the huge drop off in battery life, even after I bought a new battery. I might try LG again next year with a faster chipset inside. The Snapdragon 808 was too slow. I had a Note 2 and Note 4. I tried the iPhone for the first time when TMO came out with the Jump on Demand promo and $15 a month iPhone thing. I’d never owned one before, so I figured I’d try it out. After about 3 months, I am fairly certain I am going to switch back to Android. I’d get a Nexus if TMO offered it, but I think I might take them up on the Note 5 deal they have going. The iPhone is a nice phone, but after using Android so long, some of the things I can’t do are irritating. I imagine if you only ever had an iPhone it would be perfectly fine. Wow man, you just described my situation exactly. But I will fulfill my iphone JOD for another year and won’t go back to iphone again. I have a V10, I had some weird wifi issues but ended up reading elsewhere that the wifi issues are in part due to the T-Mobile connection assistant, disabled it and I’ve been fine. Youtube freezes but only on 1440p videos posts I’ve read make it seem like it’s just a software bug that should be fixed with marshmallow. Sure, it’s disappointing but on such a small screen there isn’t that much of a difference at “only” 1080p. I can’t stand ads in the youtube app whatsoever so I use firefox with an ad blocker whenever I feel an urge to watch something, most videos are still under 1080p anyway so it hardly bothers me. I needed the 64gb internal + SD + battery so for me its definitely not worth giving up on it unless it never gets marshmallow. For ringtones on ios, pick a music clip up to like 30 seconds, .wav or .mp3. then in itunes on your computer import the file to your library and right click it to make an AAC version. once that’s done right click on the AAC version in itunes and click “Show in Windows Explorer” then move the AAC version into your itunes library’s ringtones directory, I think you then have to have it re-scan or import the file over again so it knows about the location change. if you have it set to sync all ringtones then it should show up next time you perform a sync. For a platform touting “It just works” they sure have some pretty damned annoying work arounds because they try to lock you out and force you to buy ringtones. Thank you so much. I just made it home and I am trying to make a ringtone and import it to the phone right now. Read that from another popular site but wasn’t reported here. This upcoming deal offers a larger discount on those models and also includes the S6 edge and S6 edge+, as well as a free year of Netflix for all four phones. Well I was pointing it out because a friend of mine was excited that he could get potentially $175 off but I let him know that wasn’t the case. I almost feel stupid asking whether this is even possible and know its naive to, but here goes – does anyone think there’s really any way to combine the two offers? If not, which do people value more? an ADDITIONAL $100 Google Play credit! If it’s really possible to do all of that, it’s amazing, and makes me wonder why Samsung would allow it. Most likely their terrible sales as of recently. BUT, Magenta isn’t telling us about the other promos. That’s the catch. How many of us will upgrade? Not gonna lie, I’m SERIOUSLY thinking that the Note 5 is worth it with these deals. Then sell it with the accessories when somehting else better comes out. I miss the SD slot. T Mobile and Samsung through online chat are sending different signals about this. T Mo says you can get all the offers, while Samsung says you have to choose one of theirs. To me that means its still worth considering but isn’t a slam dunk. $299 to accessorize the phone significantly reduces the upfront out of pocket cost of the switch, and then I guess you have to decide whether the Netflix year (I pay for it anyway) and $100 price reduction are worth the taxes and fees you have to pay upfront. You’re right that the carrier isn’t publicizing the bundle of promotions, and that is a catch. Old thread, but it seems like the T&C’s specifically state that the netflix promo can be combined with ONE of the samsungpay promos ($50 rebate or $200 samsung.com credit), but that the other samsung promos (including the $299 gift package) cannot be combined with any other samsung promos, which reads to me to also include the samsunpay promos (note that the netflix promo says it can be combined with other tmo promos and samsungpay promos only). So I believe you can only get one samsungpay promo and one netflix promo, but not all of the samsung promos (e.g. gift package and samsungpay promo). Anyone have confirmation from samsung? We shall see, i applied for all of the ones i could. I did the accessory bundle and the samsung pay so I don’t see why not the others as well. just have to make sure to fill out the forms the way they wanted. totally forgot about the accessory bundle, it was a nice surprise lol. Oh yeah Netflix and chill time! The promotion end 14 days before I can jump. I am thinking of buying a phone out right instead. I got my nexus 6 then 14 days later prices all over the placed dropped to about 300 bucks. Tmobile wouldn’t do nothing for me. Will I still have to pay a $100 down payment for a 64 gb galaxy s6 edge on JOD or the $100 credit will cover the down payment? From what I understand, you will be credited the $100 for the downpayment. So, $0 that day if the downpayment is $100. If not, you’ll pay the differnece. Just checked this promo and it appears that the pricing on the phones have not changed from their most recent prices. It seems that the discount is off of the original price which was already factored in. So it looks like the promo is only the 12-mo of free Netflix. Can anyone else confirm this? The price right now is $579 for the 32GB version. It goes down to $479 with this offer, and you can redeem the Netflix offer separately. If I have iPhone 6s $15/month JOD for 18 months, can i do this. What will my monthly payment be? Is it 479/18= $26?? then not worth it. No, your monthly payment will be $479/24=$19.96/month for 18 months. If you want to keep it after 18 months, you pay the rest of the balance, which would be 19.96×6=$119.75 plus tax. The promo actually applies the discount to the price, and then you get the EIP payments that are lower. I grabbed the 64Gb Note 5 for $679, from $779, and my EIP payments are less then they would have been at full price.